I wish there was a clone ship for onigiri! Just like this huge Cylon thing in Battlestar Galactica: Filled with huge bath tubs where all the onigiri that have come to die are magically reborn again… an inexhaustible source. They would wonderfully reappear, freshly come back to life and immediately jump into the next spacecraft to fly right back to me and directly onto my plate… A girl can dream, right? Yes, onigiri make me happy. Really happy. So happy in fact, that I almost can’t describe it. And yes, personally I could talk about them all day long. About how easy they are to make. About how beautiful they are. About how they can be eaten cold or warm and freshly roasted under the grill. About how you can fill them or mix the rice with the ingredients or just leave the rice plain. About how perfectly you can eat them just with your hands and about how much I love to actually touch the food I eat. About how well they can be prepared in advance – and therefore are the perfect food to bring to parties, picnics or lunch break in your bento. Yes, I am madly in love with onigiri. We both are actually. So why isn’t wasn’t there a recipe on this blog yet? My bad. After all you can nicely take them with you to the sofa to indulge in a long-awaited Battlestar Galactica relapse again. It’s been too long! How much you get addicted to them depends strongly on the quality of the rice you use and the other ingredients. They can turn your “ordinary ball of rice” into some sheer poetry. In our most favourite recipe we use Cheddar… not really traditionally Japanese, but well – it’s delicious, so what!? Put the rice into a sieve and wash it under cold running water. Cook it in a rice cooker according to the producer’s instructions or in a pot on the stove: Add 2 cups of water to the rice in the pot. Close the lid and switch the stove to low (heat level about 2 of 10). After 10 minutes switch to medium heat (level 4-6 of 10 – depending on the kind of stove you have) and let the rice steam for 10-15 minutes. The water should not boil and you should keep the lid of the pot closed. After 15 minutes the rice should have absorbed all the cooking water and it should be tender und fluffy. Pull the pot away from the stove. Get a spoon and carefully fold the rice before closing the lid again and let the rice rest for 5 more minutes. Let the cooked rice cool down. Drain the tuna and mix it with the other ingredients for the filling. Season to taste with additional chili, cheese or ginger if you like. Cut the Nori sheet in half and cut those halves again in 4-5 rectangles each. Moisten one of your hand palms and put 2-3 well-heaped teaspoons of the rice on it. Gently press it down a bit. Add 1-2 teaspoons of the filling on top of it and cover with 2-3 more teaspoons of rice. You can also use an onigiri mould for this: Dip it into water too, before filling it, and fill it up loosely right up to the top. Now use your other hand (or the lid of the onigiri mould if you use one) and press the onigiri to your preferred shape. 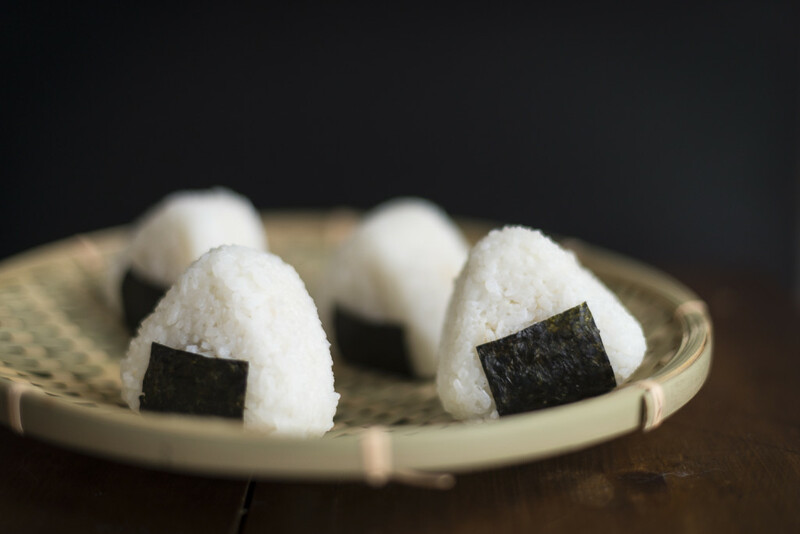 Wrap the onigiri in nori, brush a little of the sesame oil over it and sprinkle it with sesame. Arrange on a plate and serve with soy sauce and green tea if you like. Or dip them in this sweet and sour chili sauce. Heaven! 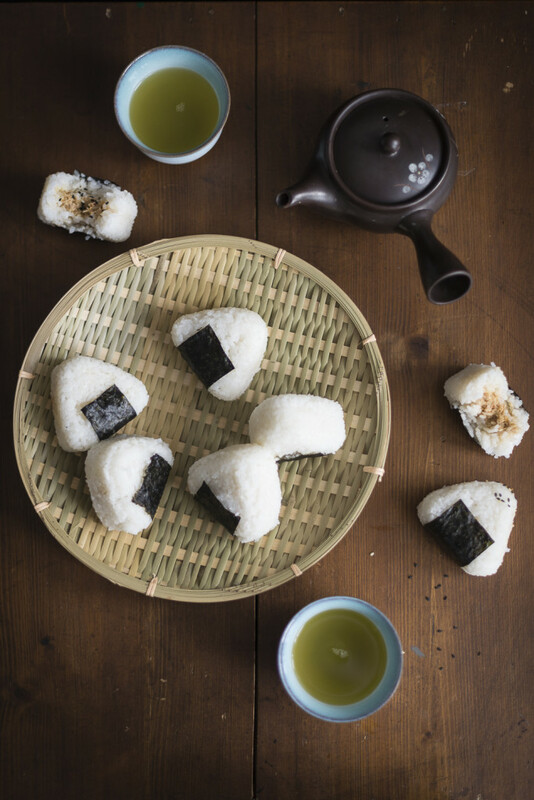 The onigiri taste best when they are fresh but are also perfect companions for a bento on the next day.